Sure, you have your dresser and nightstand to stash away clothes and nightly reading material, but what about all of those random little items that don't seem to have a home? Things like meaningful artwork, plants, votives, or your overflow of shoes and sweaters? Some bedrooms feature a surprising number of nooks and crannies to store stuff and display sentimental treasures, you just have to know how to work with your space. You could hang a single floating shelf to accommodate some of these objects, or push the creative limits and imagine unique bedroom shelving ideas that truly utilize the specific features of your room. To keep things looking oh-so-tidy and shockingly cool in your sleeping quarters, here are seven shelving ideas to stoke your inspiration. 1. Maximize a random niche. If you have an inset space in your boudoir and no idea what to do with it, consider installing a set of shelves. 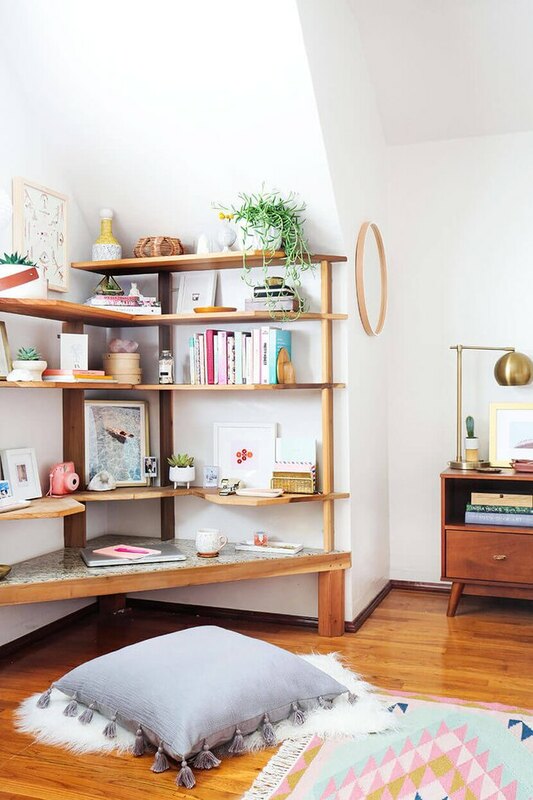 This dreamy bedroom shelving idea from blogger Caitlin Kruse of The Mama Notes features three seemingly built-in shelves that make the most of a difficult corner. In addition, they create the perfect display space for books, vases, and other knickknacks. Bonus tip: Place shelves near electrical outlets so you can also include a lamp or two in your shelfie. 2. Allow bedroom shelving to double as a closet. Do you have a small bedroom with zero closet space? We feel your pain, but that doesn't mean you have to settle for squishing your shoes and sweaters into a teeny, unwieldy closet. Treat your wardrobe as another piece of decor and showcase it on a full wall of shelving. 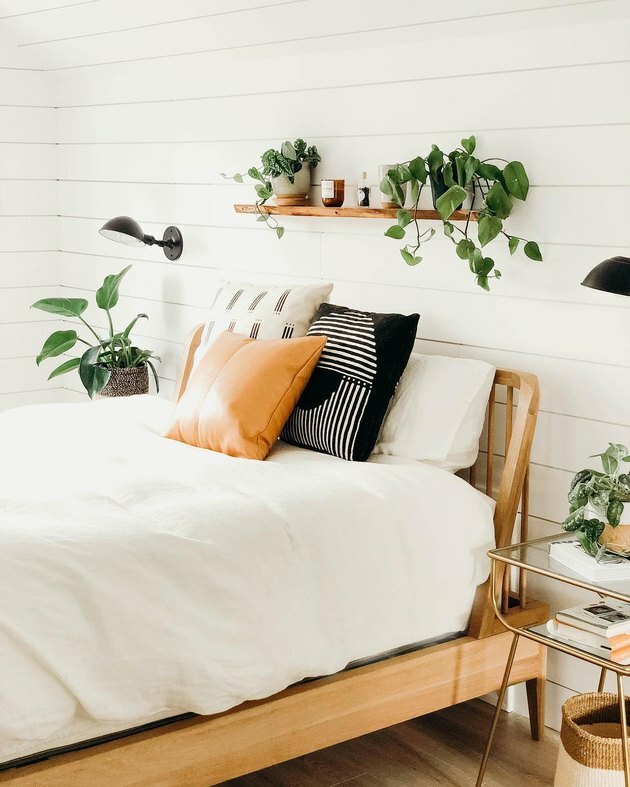 That's what lifestyle blogger Jess Ann Kirby did in her bedroom, and the result is a completely chic look. Bonus tip: Install shelves around a window so you can make the most of an otherwise empty wall. 3. 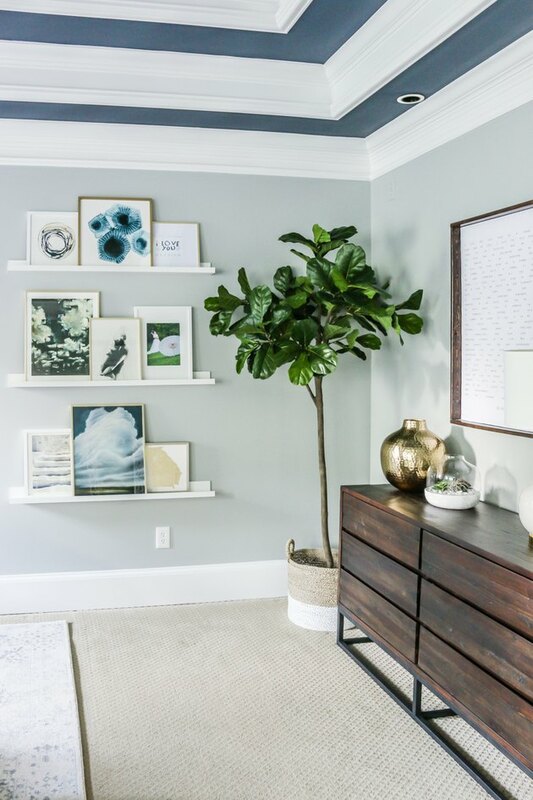 Anchor a gallery wall with floating shelves. Sure, a gallery of your fave artwork looks amazing when you hang them directly onto the wall, but they also look pretty cool leaning on a set of shelves. This bedroom shelving idea designed by Katie of Bower Power showcases a pretty and cohesive collection of art that takes up residence on white floating shelves. Bonus tip: Use a level to make sure your floating shelves match up with one another and look perfectly even. 4. Work shelves into bedroom decor. 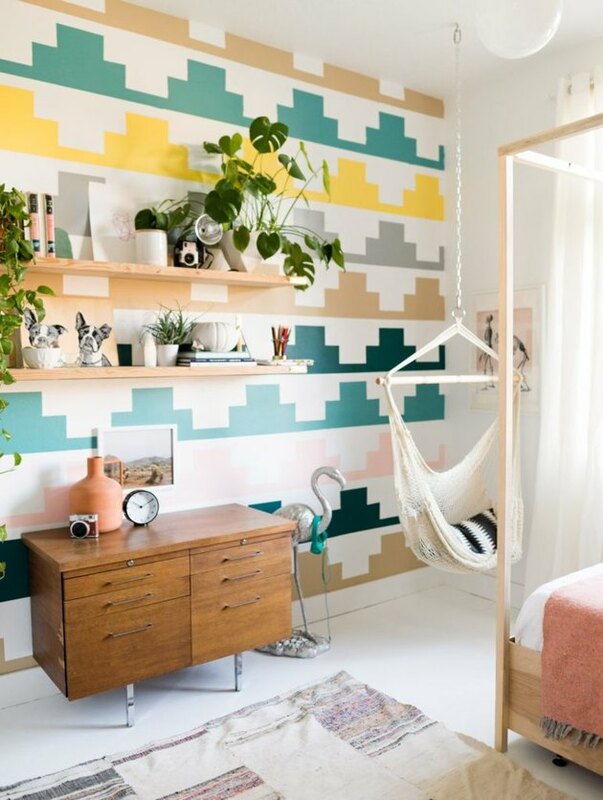 In this fanciful bedroom crafted by Mandi of Vintage Revivals, DIY wood shelves with gold brackets blend in flawlessly with the punchy, patterned wall mural. Decorative objects on those shelves help to reinforce the whimsical visuals throughout the room. Bonus tip: Don't match your shelving brackets to the rest of the hardware in your bedroom — mixing metals will help create even more visual interest. 5. Use shelves instead of a nightstand. 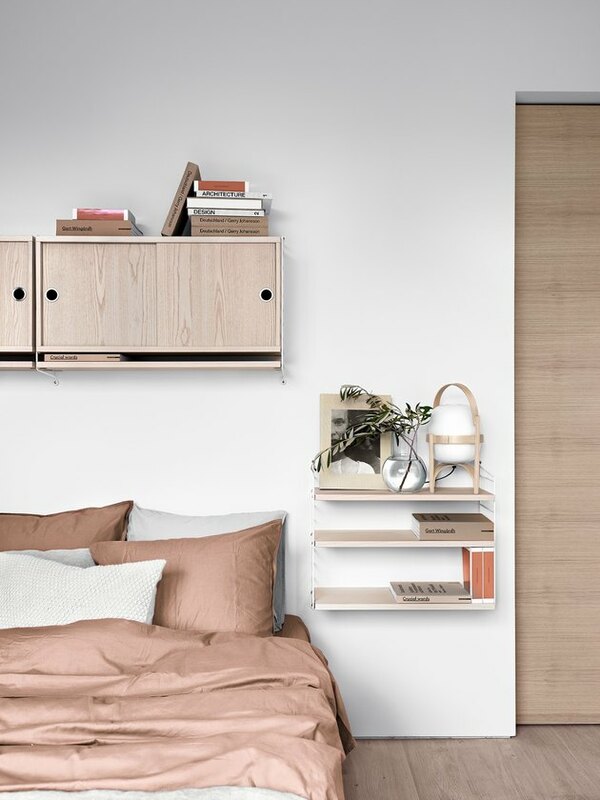 For a super-fresh and modern feel, skip the nightstand and hang a set of contemporary shelves instead. We know, it's a bit controversial to suggest that a nightstand has no place in a bedroom, but it's a good way to depart from tradition and keep all of your essentials out in the open. In this bedroom styled by String Furniture, simplistic shelving pairs beautifully with the wall-mounted cabinet above the bed and rose-colored sheets. Bonus tip: Since it's a random strip of wall space, be sure to measure the area between your bed and the edge of the wall before purchasing your shelving unit. 6. Squeeze shelving into a tight spot. A bedroom can be filled with head-scratching corners and angles, and we're here to tell you that there isn't a shelf in the world that can't fit those hard-to-fit spaces. 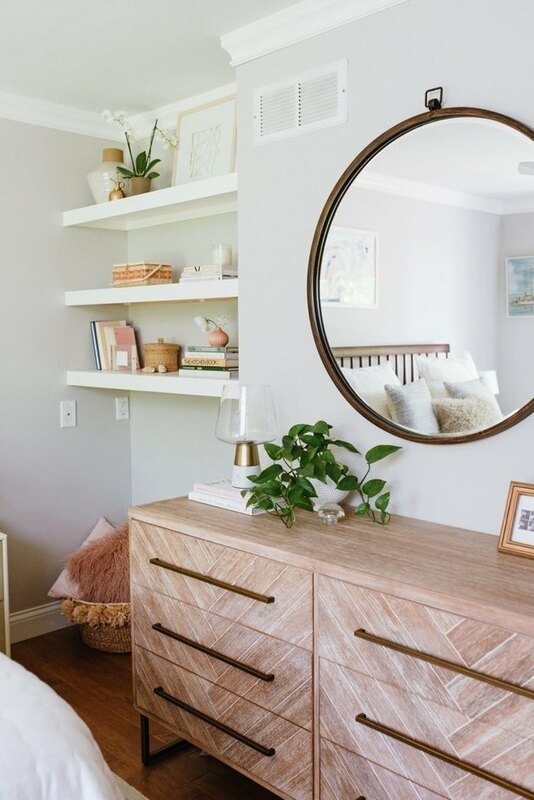 That's because you can always build a custom shelf for any haphazard gap in your bedroom proven by this wooden unit styled by Emily Henderson, which fits snugly into a corner. Bonus tip: There are plenty of DIY options online to help you build your own shelf. Otherwise, you can call on a millworker or closet installation company to help you out. 7. Enhance, or replace your headboard with a shelf. A bed doesn't always need a headboard. Instead, focus that attention on bedroom shelving. In this en suite belonging to blogger Amanda Jane Franz, one small shelf is the ideal finishing touch, completed with verdant plants and luxe candles. Bonus tip: Be wary of hanging a floating shelf above your bed if you live in an earthquake-prone area — perhaps consider a less risky area of your bedroom to display your shelf.